I'm sitting typing this whilst dunking Hobnobs in my tea. 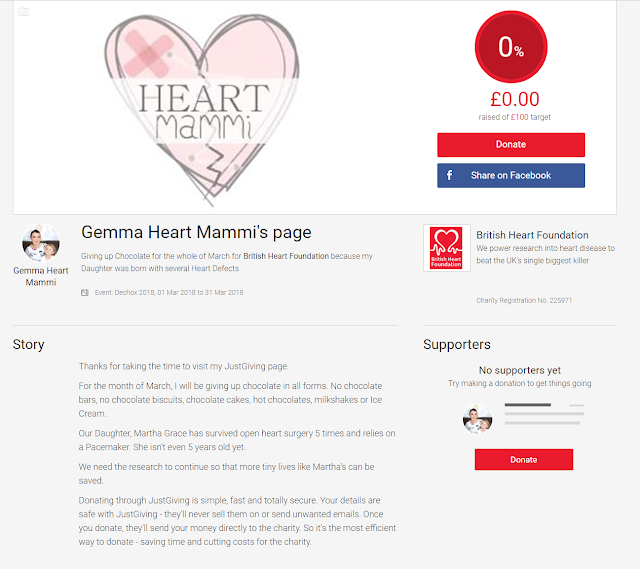 I've decided for the month of March I will be participating in DECHOX, raising money for the British Heart Foundation. Someone at work suggested I should try to give up tea instead, but I don't think anyone would want to live with or work with me without my Panad. I don't know if they'll be any safer with me giving up chocolate but it's a risk I'm willing to take. I'd really appreciate your support, words of encouragement and if you can - your sponsorship. You can find my Just Giving Page here. I'd be extra grateful if you could also "share" my page while you are there. I now have the rest of February to cram as much chocolate as I can into my diet. Luckily our anniversary and my birthday are in February. Mother's Day will be a struggle but I'm doing this for an amazing cause.